The Faroes started brightly and weren’t far from taking a lead after a minute when a cross fell to Fróði Benjaminsen whose shot from close range was block by Jérôme Boateng in the last moment. The luck was on the Faroese side shortly after when the ball struck the underside of the crossbar, but stayed out. 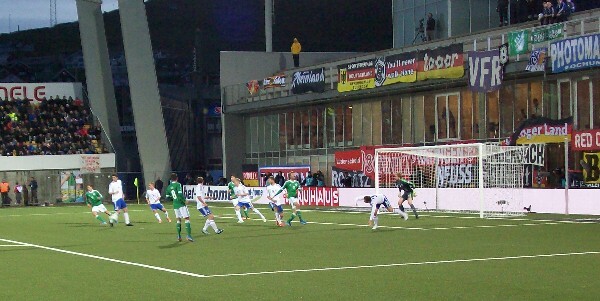 Poul Jóhannus Justinussen then had a go for the Faroes from long range that forced Manuel Neuer to punch over his bar. The rest of the first half - half an hour – belonged to the Germans, who earlier also had an appeal for a penalty turned down – one that a majority of referees would have given. The luck was again on the Faroese side in the 21st minute when Miroslav Klose’s effort clipped the post, but it was just prolonging the pain as the Germans took the lead from the following corner, where Boateng rose highest to head goalwards where the other centre-back Per Mertesacker had the last touch before the ball crossed the line. Germany went close a couple of time, but the Faroes managed to escape to half-time with the single goal down. Although Germany had all of the possession from the start of the second half, they didn´t create clear-cut scoring opportunities, and after Rógvi Baldvinsson had saved Sami Khedira's header off the line midway through the half, the Faroese team was sensing they could perhaps make the surprise equalizer if the just got that one chance. However, in an attempt going forward after 72 minutes, Justinussen’s cross ended with a German counter-attack where Thomas Müller outpaced the Faroese defence and was in the end tripped by Atli Gregersen who was sent off. Mesut Özil safely converted from the penalty spot. Thomas Müller then sealed the 3-0 win the 84th minute with a strike from close range after the ball had dropped right in front of his feet.